THIS WAS a head scratcher. How could Hibs play so well last Monday to defeat Rangers at Ibrox and then fail to beat Raith Rovers at home? Had Raith’s goalkeeper Ross Laidlaw, who has replaced the injured Kevin Cuthbert to good effect, not been on his toes as early as the fourth minute, this match might have been entirely different. As it was, the 22-year-old pulled off a superb double save from Jason Cummings, instinctively parrying the striker’s drive and then denying Cummings again as the Hibs’ player flicked out a foot and directed the rebound goalwards. The key to this match was solid defending by both sides, albeit both defensive performances were marred by single lapses. Hibs had Jordon Forster, Paul Hanlon and Liam Fontaine in defence with Lewis Stevenson keeping his place at right wing-back after coming on for the injured David Gray against Rangers. Rovers went with a 4-5-1 formation, former Hearts striker Christian Nade spending much of the first hour in isolation up front, with only the tricky Barrie McKay really helping his cause. Nade caused no end of trouble for his opponents, nevertheless, firing one early ball low across Mark Oxley’s goal where Martin Scott just missed connecting. Hibs gained the upper hand around the half-hour mark, Scott Allan’s effort deflecting off Laurie Ellis and going wide before captain Liam Craig had two shots on goal in as many minutes, the second a tremendous volley which whistled just past the post. Raith’s best chance of the half fell to McKay after 42 minutes. After the Hibs defence looked to have cleared a corner, McKay picked up the ball some 25 yards out and let fly, his shot cannoning back off the bar with Oxley beaten. Just when it looked as though we would get to half-time without either goal net bulging, Hibs fashioned a goal out of sheer persistence. Stevenson and Scott Robertson combined down the right and the latter’s low cross was cleverly backheeled goalwards by Cummings. The ball was heading wide, however, until Booth slid in at the back post and directed the ball across goal to Robertson who had kept running and could not miss from two yards out, the Raith defence standing statuesque as the goal was scored. In injury time at the end of the half, Oxley had to look lively when Rory McKeown’s free-kick from fully 30 yards out dipped and swerved towards goal, the goalkeeper diving to punch the ball clear. Raith Rovers’ manager Grant Murray told his troops at half time “not to crumble” and he was delighted with the “good character” they showed in a much improved second-half performance, though had Allan picked his spot rather than hitting his shot straight at Laidlaw early in the half, Hibs would surely have gone on to win. Without creating too many clear cut chances, Ryan Conroy’s tame effort straight at Oxley being one of the few, Raith pressed further upfield and the home fans were becoming restless. Then, as has been written before this season, Hibs lost a goal that was the combination of bad luck and a momentary loss of concentration. The equaliser in 68 minutes was started by Conroy causing the Hibs defence to panic and fail to clear, the ball suddenly falling to Nade all on his own in the box, the striker slamming the ball low past Oxley, the player celebrating so wildly he was booked. The goal transformed Raith’s appreciation of their chances of winning, as they began to really press Hibs at times, helped by the sheer number of missed passes by the home side. Near the end, Hibs did mount a series of attacks, but the final ball went too often astray. 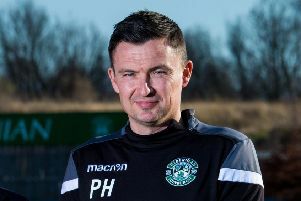 Substitute Paul Heffernan connected with a header off fellow substitute Dylan McGeouch’s last minute corner, but the ball flashed wide and Hibs had to settle for the draw. Raith Rovers: Laidlaw, Thomson, Watson, Ellis, McKeown, McKay (Stewart, 72), Fox, Scott, Moon, Conroy, Nade. Subs not used: Anderson, Callachan, Vaughan, McGurn, Matthews, Bates. Referee: J Beaton. Attendance: 9,954.